These parts are for the Cover Valet-250 and the Cover Valet-400 Spa Cover Lifters. Part # CVEE (Finger) is the new style of Finger. They are now held in with a set screw instead of being screwed into the extension arm. If you are replacing the old Screw in type fingers you must purchase both fingers and a new Extension arm for these fingers to attach properly. We now sell the fingers and the extension arm in a complete set. The Part Number is CVEAF. If you need fingers you must replace the extension arm as well. Please order part # CVEAF and you will receive a set of fingers and the extension arm. If you need fingers for both sides of the lifter, Please order 2 of Part # CVEAF. The parts listed can be used on both the Steel and Aluminum Cover Valets with the exception of the Channel Brackets and the Locking and Non-Locking Shocks. These are not interchangeable. If you are ordering Channel Brackets or Shocks, Please make sure you order the correct Channel Bracket or Shock that corresponds to your version of the cover valet. 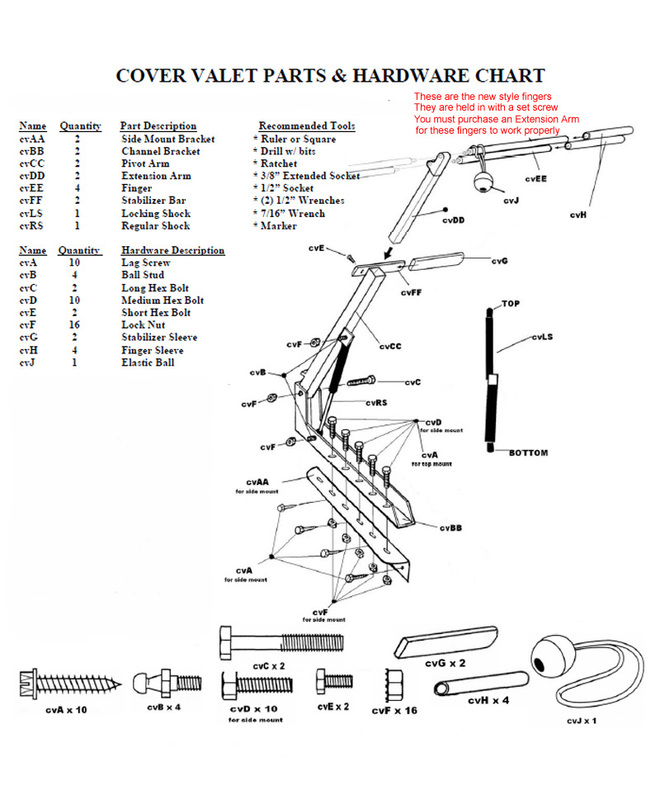 Please note: Cover Valet is starting to discontinue the Steel Lifter Parts. purchase a whole new lifter. Click the button below to add the Cover Valet Parts to your wish list.